Here’s a summary of activities that have taken place at HimeWorks for the month of December 2015. The purpose of this summary is to let you know all of the plugins that have been created, or are currently in progress, and potentially future plans that I have for the next month! The purpose of the patreon is to provide a way for me to offer some exclusive content, in return for your support. I feel this is more useful as a donation option since you can get cool stuff in return that others don’t get to see! In total, there were 40 supporters in December, compared to 18 in the previous month, which is a great increase. I’m wondering if there’s anything specific that you’re pledging for, that I should do more of. Let me know what you think. I have been publishing more “dev log” type of posts, which are exclusive to supporters that are pledging $1 or more per month. The purpose of the dev logs is to allow you to get involved in my own development processes, where I talk about things like design considerations, issues that I’ve run into while writing a certain plugin, as well as ideas I’ve had but haven’t completely figured out how I might go about implementing them. Reflecting on the posts, more effort could be made to explicitly ask for feedback. Phrasing things in terms of questions instead of statements generally appear to be more inviting. I will take this into consideration in future posts. Beta testing is available for supporters that are pledging $5 or more per month. This allows you to try them before I release them to the public. So far I feel it hasn’t been executed very well, and could be presented in a more structured way rather than just a single post that says “beta test! Here’s how it works, and here’s the link” and that’s it. I definitely should consider putting together a list of plugins that are in beta testing somewhere. For supporters that are pledging $10 or more per month, I am offering to promote you or your work in my videos. So far I have not advertised this very much, so you might not have known about it. I offered 5 spots for “early” featured supporters, which have all been snatched up. You can see them in the Thank You section of my main patreon page. Early featured supporters get to have their banners displayed publicly on my patreon (and later, my website, when I have come up with a design for it). Apparently this main page isn’t shown to supporters…so I’ll have to think of something else for it. Maybe add them to the end of each video. No new rewards were introduced this month. Is there anything you would like to see? Are you a Patreon Creator? Let me know, and I can let others know about it as well! Maybe we can promote each others’ work. The number of plugins that I’ve released this month has decreased compared to November. This is because I have been exploring new systems and designing larger systems that require a considerable amount of planning in order to write a versatile plugin. Here are the plugins that were relased in December. Allows you to manage “self-variables” for each event. Self-variables are like self-switches, except they can hold any type of data like numbers, text, items, and so on. You can have any number of self-variables as long as you can give them a name, and you can access other events’ self-variables as well if you wanted to manage them from a single location. This plugin allows you to prevent the player from moving in certain directions. For example, you can an event to allow players to move left and right, but not up and down, during a cut-scene. Movement directions can be locked and unlocked anytime, and supports both 4-dir and 8-dir movement. This plugin allows you to customize the small icon that is shown in the message window when it is waiting for the player to press a button to continue. You can create animated cursors of any size and any number of frames, and manage them easily using a simple set of script calls. This plugin allows you to customize the “title” of the save game. 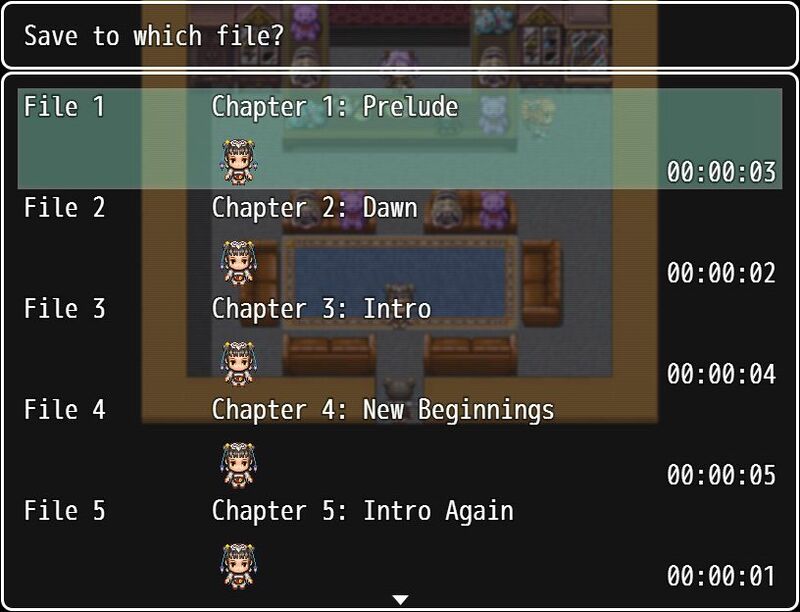 When the player saves their progress, the game will choose a title to display for the save file, which is the game’s title by default. Now you can customize the save title based on the player’s progress during the game. This plugin allows you to “synchronize” save data whenever the game is saved. Certain switches and variables can be designed as “sync” data, which means when you change its value in one game, it will affect every other game. Sync data are also accessible from the title screen, so if you wanted to create conditions based on certain progress in the game, you can use sync data to keep track of it.Here’s a video demonstrating how you can “change the past” by changing variables in one game, which affects other save files created in the past. This plugin allows you to designate that certain equip slots must have something in them. Basically, the player can’t remove an equip from that slot, but they can freely change what the equip is. This is the first add-on for Actor Battle Commands. It allows you to assign skills directly to actors as commands so that they can use the skill directly without having to go to the skill selection menu. This plugin allows you to customize the amount of experience required to reach the next level. Rather than using a specific formula provided to you by the engine, you can use an external file that can be managed using spreadsheet software to keep track of your EXP values for every actor. This plugin allows you to specify negative element rates as a trait. This is primarily used for “reversing” a certain elemental effect. 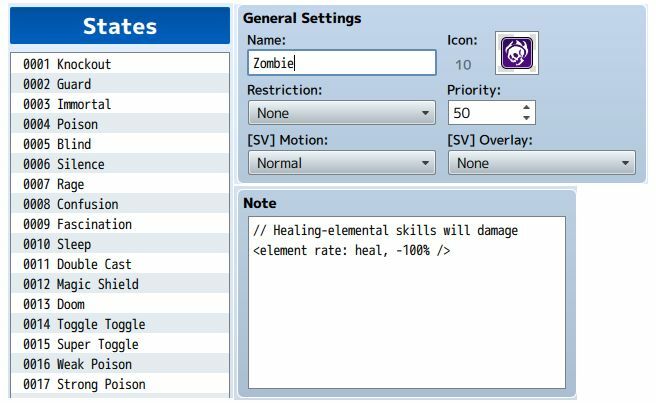 For example, if a light-elemental cure spell originally heals you, having a negative element rate would result in receiving damage from it. Currently, there are a few plugins that I’ve been developing on and off from time to time for the past month. They are a bit more complex so it’s taken some time to figure out how to implement them. A set of plugins that will provide you with more control over your messages, such as having a message window pop up over a character’s head when they are speaking, showing pictures instead of faces during dialog, having custom animations depending on whether someone is speaking or listening, displaying multiple messages at the same time, and so on. A set of plugins that provides you with more shop related functionality. The core “shop manager” changes the way shops are handled, giving you access to a number of mechanics that originally isn’t possible with the default shop implementation. A set of plugins that allows you to create animations during the battle, such as moving backgrounds and other effects. I’ve recently announced my interest in developing a tactics battle system which will allow you to implement a tactics battle system in your game. This is a fairly large project that I’ve never done before so I’m not sure how long it might take to complete. I post regular discussions and updates on Patreon to track my development progress. I have a few game ideas that are currently in development. They are more like mini-games to demonstrate how RPG Maker MV can be used for projects that are not limited to a conventional RPG genre. So basically, instead of just making the game, I’m also releasing tools to allow you to build your own! For free! I will post more information when more work has been done. I think that it’s really a good idea to make tool to help everyone making better great game with RPG Maker MV thank you for that !